Doom isn't the only aging shooter than's getting bloodier through modding. 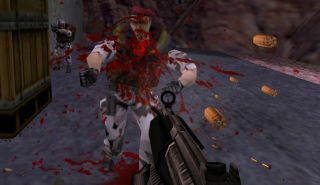 Now Half-Life has received a generous dose of gore and gibs with the Brutal Half-Life mod. Inspired by Brutal Doom, the adventures of Gordon Freeman have taken a turn for the gross with dismemberment, decapitations, gallons of blood, and some new moves. Oh boy. I done made a mess of Barney. Instead of just shooting monsters and soldiers, now you can chew off their individual limbs with bullets or pop their heads off with a shotgun blast. In fact, if you shoot off all their arms and legs, they'll flop to the ground and writhe around, still alive. You can smash their bodies into splattery glop, too. Those Barneys sure have a lot of blood in them. At least they used to. Sorry, Vort, but the easiest way to get your collar off is by removing your head. Not only do your opponents get covered in blood, you do too. After wading through the gooey spray that results from hyper-violent close-up combat, your weapons will become caked in gore. Speaking of weapons, there are a couple new ones. The M249 from Opposing Force has been added so you can really let some lead fly. And, Doom's own BFG can be collected, letting you put the green-glowing smackdown on crowds of enemies. Not surprising that your own weapons get covered in blood. There are some new animations, because as you'd expect, when you shoot someone's leg, arm, or head off they tend to move a bit differently. There are also added effects, like different types of explosions and smoke. The mod also comes with its own map, a sort of arena-style monster zoo for you to run around and fight whatever sort of enemies you like, accessible from the main menu. And, the mod allows you to kick a dude, just like real scientists do. I always felt like Freeman should have been able to kick. He's gotta have strong legs after all the walking, sprinting, and standing in Limbo he's been doing. Just open the door, Brainiac. Brutal Half-Life can be found here, and it comes with its own installer which adds it to your Steam games list after a restart. It's only in beta, so I did get a couple crashes and once or twice maps didn't load properly. Otherwise, it's a bloody good time.